At Wolfwood Refuge we have over 60 animals and are constantly updating and adding to the existing wolf biographies. 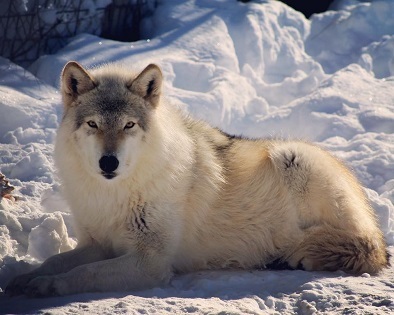 Scroll through the page to view the wolves or select a wolf from the list to view them directly. > No wolf selected Abra Akayla Apollo Archie Aspen Chaco Chai Chica Dante Danu Destiny Druid Echo Eileen Finn Gideon Goblin Grace Henna Ipo Jill Jinn Justice Kodiak Liri Majesty Mica Moki Nikki Nyx Razi Sable Sam Samoa Sienna Siku Siren Smokey Stella Storm TJ Valkyrie Vesta Wile E.
Abra joined Wolfwood in August of 2016 as a very shy, skittish, 2 year-old wolf/dog. She came from Montana where her owner ran a grooming shop and kept Abra in a small kennel, never allowing her out. The owner would not give Abra adequate water because she would have to pee too much and the owner didn't want to be bothered taking Abra out. 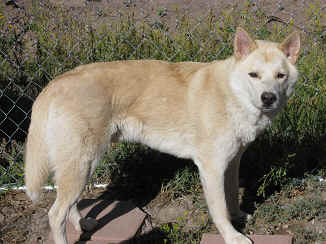 Another couple in Utah had Abra's sister, who was loved and well cared for. When they learned that Abra's owner was going to put her down they went to Montana to get her. They hoped that she could be re-homed with her sister. It took weeks for Abra to come out of her small kennel because that was all she knew. After 6 months of effort, including Abra jumping off their ten-foot deck, they realized that she was not going to settle in to city life. Abra is exceptionally shy and lives with Apollo. Akayla is Trinity's twin sister, and also sister to Rowen. 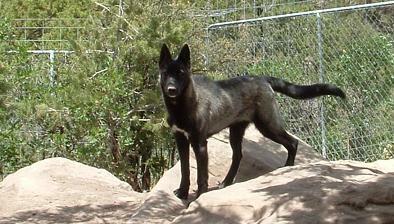 She came to Wolfwood shortly after Trinity in January of 2009 as ayoung pup. Akayla had been severely abused; her front legs had substantial damage done to them and both needed to be in casts for 6 months. Due to Joel's excellent care, she did not require the extensive surgery the vets thought she might need. She is now fully healed and is slowly becoming less shy. She lives with Sable and has grown to be quite sociable with his companionship. 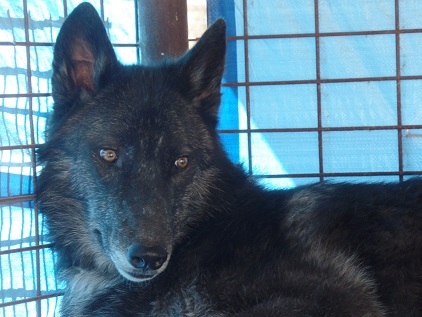 Apollo is a young, energetic, male wolf/dog. He joined the Wolfwood pack in July of 2016 as a 2 1/2 year-old. He was mistreated as a puppy and was saved by a young man Craig works with at the mine. He and his wife provided Apollo with a good home. But, a tragic accident in the mine caused massive injuries to Apollo's owner. After multiple surgeries, amputation and a fight for his life, the owners realized that the family could no longer keep Apollo. They had to move to a city to be closer to the medical care Craig's coworker needed. Everyone was very sad, including Apollo. He misses his family very much. Apollo likes to jump and can leap quite high. He is a large, strong animal and has adapted well to Wolfwood. He is especially fond of getting pets and having neighbors. 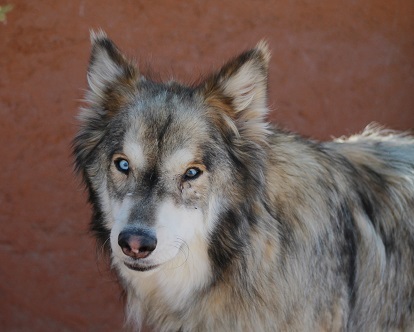 Archie is a wolfdog who came from Aztec NM in January 2014. His owner had rescued him, but Archie could not be contained. He got out and was too smart to be recaptured. He ran around Aztec, causing no harm and even taking walks with local towns people and their dogs. He would eat hotdogs from their hands. He is quite a character. Tina and the folks at the animal shelter tried to catch him for several weeks, even buying a special net gun. He still evaded all attempts until Craig went down with our new dart gun and sedated him with the first shot. He was taken to the shelter and neutered. He was transported here and now lives with Danu. He is handsome, sweet and curious. He wants to be petted but is still shy. Aspen is a young, rowdy animal. She came to Wolfwood in 2009 at the age of 3 months after a court battle with the puppy mill where she was born. While she is not aggressive and can be handled by anyone, she still has her puppy energy and likes to play rough. Chaco is a male wolfdog from Ohio. He joined the Refuge, along with Liri, at the age of four in January 2018. 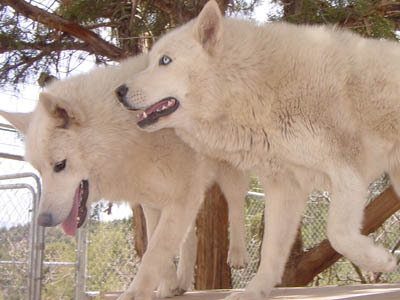 Chaco and Liri are a bonded pair of wolfdogs. 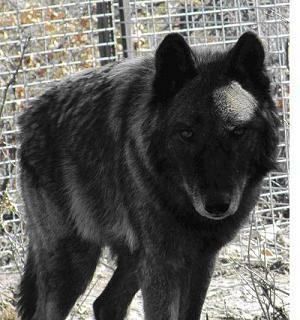 They had been well cared for by their owner who had several wolfdogs. However, due to complaints from neighbors, the animals needed to be crated at night. The owner had been trying to find a good home for them for a while. After failed attempts with several other refuges, the owner found Wolfwood and she made the long drive from Ohio to the Refuge to personally deliver Liri and Chaco. Chaco is a dominant animal and is very social. He has taken on the role as one of our ambassador animals. Chai is a dog that joined the Refuge volunteer staff as a 14-week old puppy in September of 2016. She has a special role at the Refuge as both a family pet and a companion to Wile E. Long time readers of the Refuge's history know that we sometimes adopt dogs for special purposes at the Refuge. While on a road trip, Paula stopped at the Flagstaff animal shelter in search of a dog that was about the same age and size as Wile E. She found Chai there and adopted her. Chai is an extremely friendly little girl who is always happy and loves everyone. She is the only animal at WolfWood ever allowed in the house, and is on the Barney couch in the evenings. Chai and Wile E get supervised playtime together and seem like a perfect match. They are so funny when they wrestle and have yet to wear each other out. Chica came from the same bad breeding situation that Destiny did. She came to Wolfwood in 2012 as a pretty 9 month old little girl. 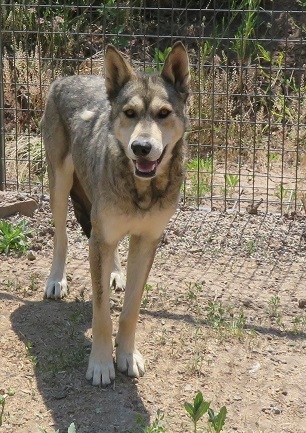 She is a very low percentage wolf/dog, but because of her terrible background she is not very social. We put her in with Smokey since Smokey is young and Chica will be able to be Smokey's companion for a long time. They get along well, and Chica is happy to run and play. This is Dante. 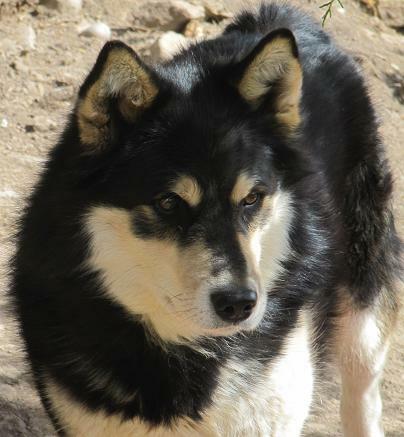 He is a young wolf/dog who joined the Wolfwood Pack in July of 2014 when he was less than one year old. He came from Aztec NM when his owner passed away. The remaining family didn't want him and he found a home with us. He was very skinny, had parasites and a bacterial infection when he arrived. However, after his vet visit he was given shots and medication and is getting healthier every day. He is a large animal and is in a bigger pen with Stella. 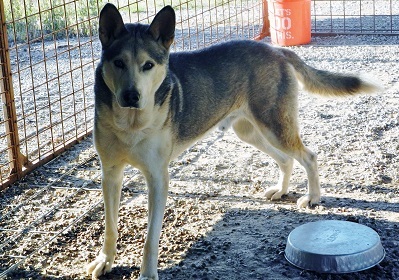 Danu came to Wolfwood in October of 2018. She was almost 4 years old at the time and came from a private family who couldn't keep her anymore. She is an athletic, beautiful, and brilliant animal who can escape from almost anything. Danu is shy around strangers but still curious, as she will keep a small amount of distance from them. Once she gets to know you, the pets will be endless. Destiny came to Wolfwood May of 2012 just a few hours before we lost our beloved Tonka. She got her name because fate seems to have made it her destiny to fill the void left by Tonka's departure even before we knew it would happen. Destiny came from people who have many wolves and wolfdogs on chains and running loose getting in trouble. They had a litter and didn't even know it, so those animals are feral and causing trouble. All of Destiny's littermates were sold at 4 weeks of age. Because she had a bad eye they took her to the Durango animal shelter where the wonderful staff there took her in, gave Destiny her first shots, and called us. She was very small, but just a sweetheart. We took her to Dr. Wagner who operated on her eye and was able to save her vision. Destiny lived with Odin until he needed surgery and required peace and quiet to recover. She now lives with Sam whose shy personality matches Destiny's. Druid is Vesta's son and the brother of Tj and Sable. He is a full dog. 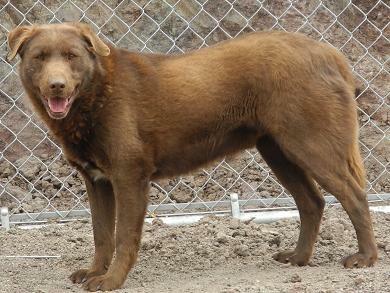 He came to the refuge in 2008 from Walsenburg, Co. with Vesta as one of her nine puppies. They were in a very bad situation and Vesta was starving and too weak to get up and walk around. She was a good mother but without nutrition, the future of Vesta and her pups was bleak While most of her pups have been adopted, Druid, TJ, Sable and Vesta still enjoy life at Wolfwood. Druid is much shyer than his siblings and tends to avoid people. 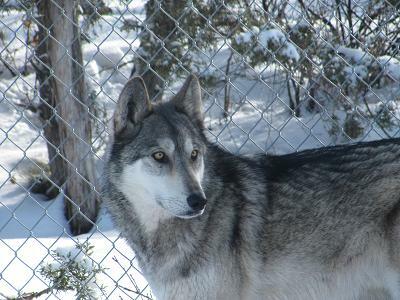 Echo joined the Refuge in January of 2009, along with her brother Pan. They came from the Larimer Shelter. Their owner had to move back east due to a family illness and couldn't take them with him. Being they were wolf/dogs, their chance of being adopted was zero. They were scheduled to be put down on the day Wolfwood contacted the shelter. Early on in their residency they were both ambassador animals. Echo and Pan lived with Storm in what was the most visited enclosure at the Refuge. It was always full of energy and general silliness. Pan passed away in January 2017 and Echo continues to live with Storm. 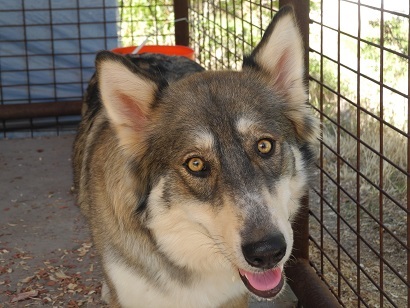 This is Eileen (aka Leena) She is a two-year-old wolf/dog who came to Wolfwood, from Utah, during October of 2014. Her family loved her but they did not have the right situation for her to be in. It made them sad but they knew that coming to WolfWood was best for Eileen. She is a sweet girl who is already becoming a favorite. Eileen is adjusting well and lives with Mica. Eileen was named after the wife of a generous Wolfwood donor. 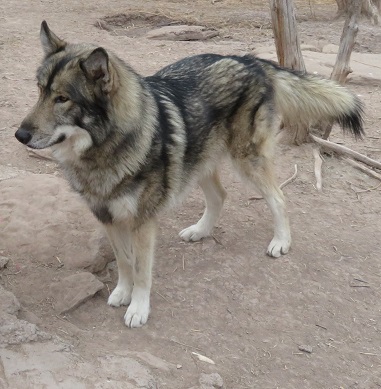 Finn joined the Wolfwood pack in March of 2014 from the Aztec Shelter. He is a large animal and is about 3 years old. We don't think there is any wolf in him; he's mostly white German Shepard. However, Finn has been severely abused. He was emaciated, weak and very scared. He has some food avoidance issues, which indicate that he was beaten when he tried to eat. His neck is damaged from the chain he was always on. As the picture shows, Finn has responded very well at the Refuge. He has filled out nicely. Finn is sweet, but originally had a distant personality. Constant attention has mitigated that and Finn now loves visits and has gotten involved with the sounds of the Refuge. He has vision problems, which we hope are genetic and will not worsen. It could be detached retinas due to trauma. He has a long and expensive road to physical recovery but we will make sure he is safe and loved and work on his physical and emotional healing. Finn is Gaelic for fair-haired. Gideon came to Wolfwood as a 10 week-old puppy in April 2018. He was donated by the owners of Cane Run Creek in Kentucky to be the Refuge's new guard dog after the loss of Kohl. Gideon is a dog and is 1/2 Great Pyrenees, 1/2 Anatolian. He is in training to be the guardian of the entrance of the Refuge. He has a big job in replacing Kohl but the size of his heart, his gentle nature, and sweet spirit are in keeping with Kohl's legacy. In his first few months at the Refuge, Gideon lived with Sheba, who provided maternal care and wolfie discipline, until her passing in July 2018. He now lives with Jinn. Goblin came to Wolfwood during October 2016 from the LaPlata County Humane Society along with Sienna. They had been running loose and were taken to the Humane Society. We believe that Goblin is Sienna's son. They are very bonded and the Humane Society asked if we could take both to give them a loving and safe environment where they could stay together. Goblin had dental issues when he arrived at the Humane Society so he was very thin from not eating. The Humane Society had dental surgery done on him and he is fine. He quickly gained back the weight he had lost. Nothing is known about Goblin's time before the Humane Society took them in. We estimate that he was about 4 years old when he arrived. Goblin and Sienna remain together. Grace came to us from the Aztec Shelter in November 2016 as a weeks old pup. She had most likely been thrown from a car. 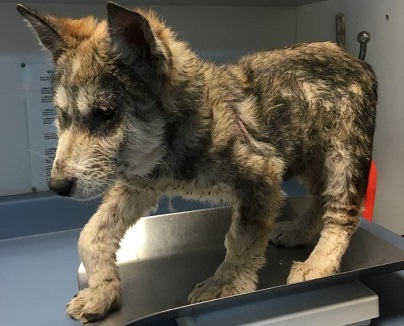 She had no front teeth; her leg was hurt and deformed; she had mange and was badly malnourished. The shelter did not have the resources to help her. Paula brought her to the Refuge and named her Grace. Grace was in a cast for a long time and was on medications for mange and parasites. Her adult teeth will came in and she gained weight. Against all odds, Grace is growing happier and more beautiful every day. 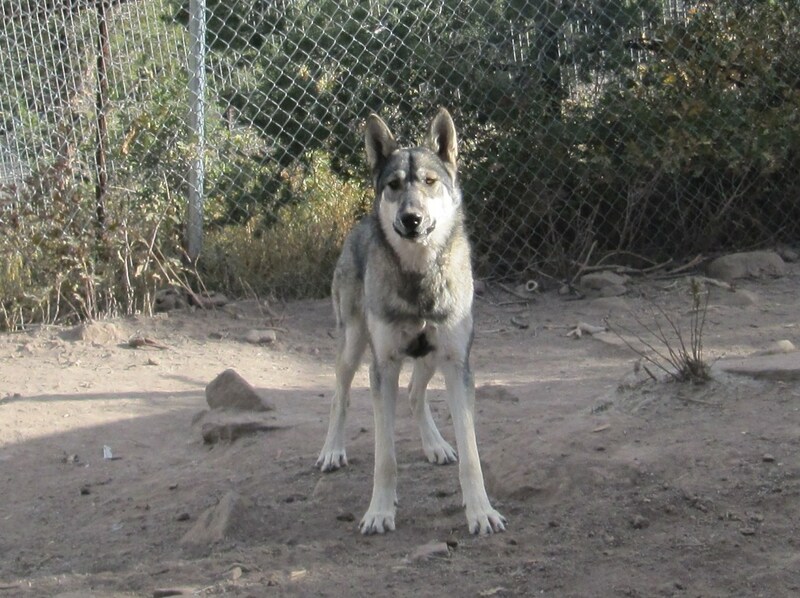 Grace is now part of the 3-amigo pack with Chai and Wile E. In a single enclosure you have a dog (Chai), a coyote (Wile E), and a wolfdog (Grace). What a collection it is. Henna came to the Refuge in September 2016, three months shy of her 2nd birthday. She was a court ordered release from the Canon City, CO area where she ran loose and killed neighbors' chickens. Brian picked Henna up and drove her to the Refuge where she has started a new life in a safe and secure environment. Henna is very affectionate and loves to be petted. Henna lives with Siren. 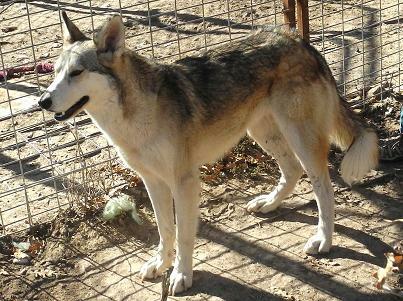 Ipo came to Wolfwood in April of 2012 as a 12 week old, little female. She is very sweet and extremely shy. 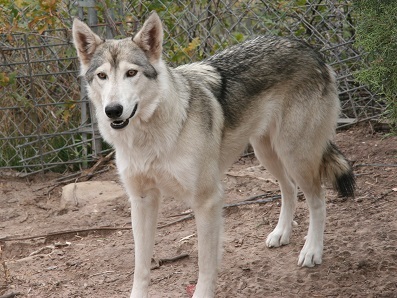 She was in the Aztec NM shelter when they contacted us. We agreed to take her, but she developed a respiratory infection and it took a while to get better. When she got better she came to live with us. She was only 3 months old and very scared. She has really grown and now lives with Justice. Ipo still is shy with people and will hide in her house sometimes, but that's ok. We are patient and just glad she is safe. 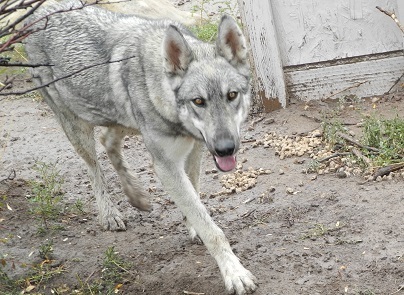 Jill is a medium percentage wolfdog who came to the Refuge in January 2014. Her age is not known but she appears to be a middle-aged animal. Both Jill and Kodiak came from the same sordid situation where 130 animals were stacked in airline crates, on top of each other, in a warehouse. The abhorrent details can be found here. Nothing is known about Jill from her time before the rescue. She was scared and skittish when we first picked her up. Jill appears to have some muscle atrophy from her time in the crate and may have some skeletal damage. 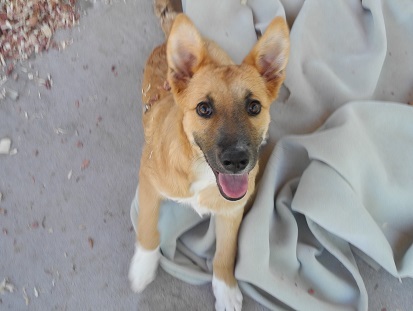 She is an energetic, playful animal and she appears happy at the Refuge. As with many of our animals, physical rehab will be a priority with her. Jill Lives with Kodiak. They now have a permanent and safe place, surrounded by people who care about them. They have room to throw back their heads and sing with the other animals that have found a home at Wolfwood Refuge. 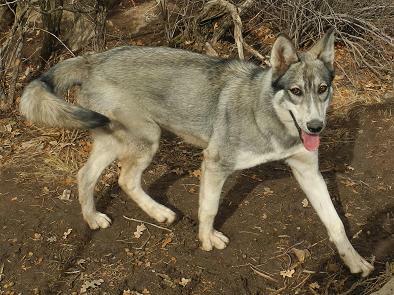 Jinn came to Wolfwood at the end of January of 2015 as a 14-week-old wolf/dog pup. Her original owner bought her on the Internet and then realized that wasn't a good idea. She was well taken care of but her owner soon discovered that she was not a house pet. Jinn has adjusted well to WolfWood. She was initially moved in with Sheba, who provided several years of maternal nurturing. After Sheba passed in 2018, Jinn moved in with Gideon and is now one of the first animals people see at the Refuge. Lennette is her favorite person on the planet. Justice arrived in May of 2013. He was born in 2007 and came from Ignacio. He is a very low percentage wolf/dog, if any. His owner had to move to a small place in town. The neighbors complained and threatened him, and he lived in a very small cage with no exercise. He barks a lot but is not aggressive. He is indeed, quite curious and will come up to investigate patient volunteers who enter his enclosure. 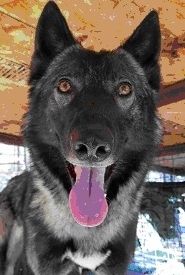 Kodiak is a low-mid percentage wolfdog who came to the Refuge in January 2014 as a 4-year-old. Both Kodiak and Jill came from the same sordid situation where 130 animals were stacked in airline crates, on top of each other, in a warehouse. The abhorrent details can be found here. 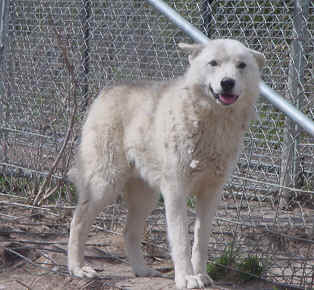 Nothing is known about Kodiak from his time before the rescue other than his age. Fortunately, he seems to have tolerated his time in the tiny crate fairly well and now enjoys spending time with the volunteers at the Refuge. If he is given the choice of food or getting pets, he prefers pets. He definitely loves attention although he prefers to meet one person at a time. If more try to visit at one time, he shies away. Kodiak lives with Jill. They now have a permanent and safe place, surrounded by people who care about them. They have room to throw back their heads and sing with the other animals that have found a home at Wolfwood. Liri is a female wolfdog from Ohio. 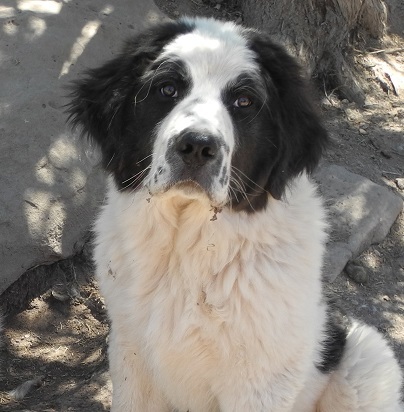 She joined the Refuge, along with Chaco, at the age of two in January 2018. 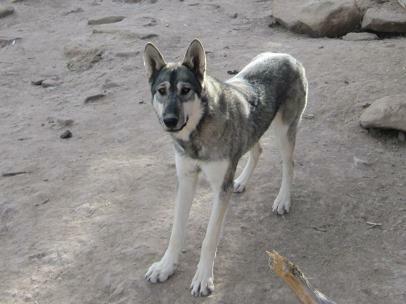 Liri and Chaco are a bonded pair of wolfdogs. 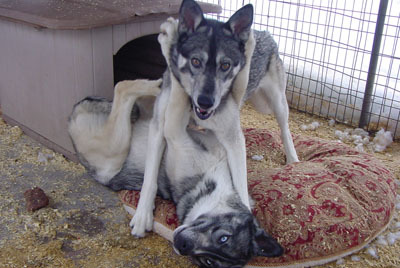 They had been well cared for by their owner who had several wolfdogs. However, due to complaints from neighbors, the animals needed to be crated at night and Liri, who is an escape artist, had to be tethered during the day. The owner had been trying to find a good home for them for a while. After failed attempts with several other refuges, the owner found Wolfwood and she made the long drive from Ohio to the Refuge to personally deliver Liri and Chaco. Liri is a bit shy but she does enjoy running the fence with her new neighbors and getting treats. 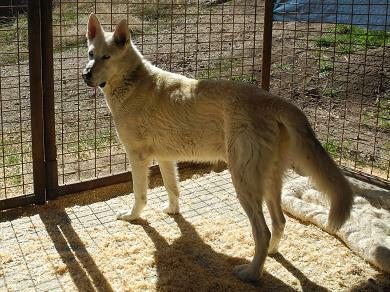 Majesty is a female wolf who came to the refuge in April of 2012 as a 2 year-old. She had spent her first two years on a chain, tied to fences, bumpers, whatever was handy. Her owners moved to a house where they could not keep her. They took her to be boarded and then called us. It took months for the marks around her neck from the chains to heal and it will take a lot of work and patience for her to ever be close to a normal animal. Pound for pound, she is our strongest animal. She loves people and wants lots of attention, but she is extremely food aggressive and will growl and snap if challenged. She is impulsive and can be hard to handle. It is a real shame because she is beautiful and intelligent, and damaged. We hope to balance out the two polar opposite sides of her personality by offering her love and boundaries. We will do our best, as always. 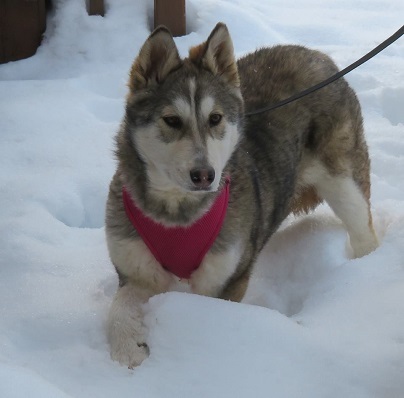 Mica is a young wolf/dog who joined the pack in October of 2014. We believe he was less than 1 year-old upon arrival. Mica came from the local shelter and was very thin when we met him. He was taken to the vet and checked out. He was healthy, but hungry. He has a very sweet personality and loves everyone. Mica has become one of our ambassador animals and is very good at enjoying the pets and hugs from visitors. 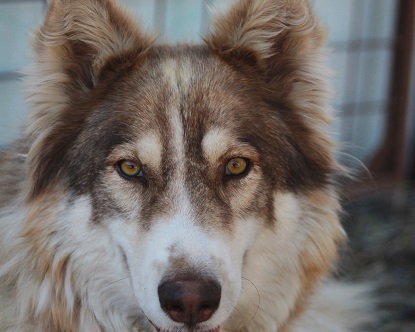 Moki came to us in December of 2018, as a 4 year-old wolfdog, from the Los Angeles SPCA. He had spent a month in a shelter in LA and an animal rescue called us about him. He flew into Denver where volunteers picked him up and transported him to WolfWood. After spending some time in the hospital pen getting acclimated and neutered, he now lives in the "Palace", one of our larger enclosures on top of the hill. He loves his neighbors and his view. Moki does not seem to know how to interact with other animals. We are hoping to teach him so he can have a friend. He has lots of energy and is very loving to people. Nikki is a dog that came to the Refuge in April of 2015 year from Longview, Texas. 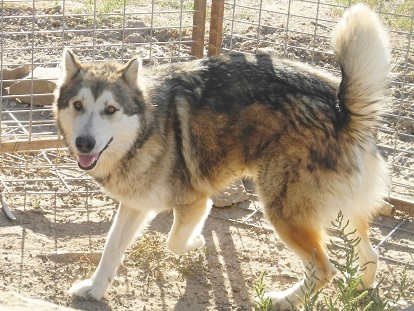 A Wolfwood volunteer had gone to pick up Vlad and saw the terrible shape Nikki was in and decided to bring him back to the Refuge. When Nikki arrived he was in such poor shape that he couldn't stand up. He was exceptionally emaciated and it was a wonder that he was still alive. 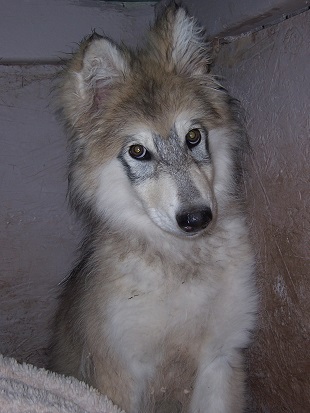 However, it is the Refuge's policy that we do everything we can to help any animal we take in, wolf or dog. Nikki was put in an isolated pen and given plenty of special food and water. After several days, he was able to get up and he started moving around. His personality showed he is a loving and gentle guy. However, Nikki had several serious infections and advanced heartworm. Nikki only had a 50/50 chance of surviving. After 2 years of intensive medical care Nikki tested negative for heartworm. He will still have the residual scarring on his lungs and he does have heart damage, but his chances of a long and happy life have improved. Nyx was born in 2015 and came to the Refuge from Aztec, NM when she was just under 1 year old during April of 2016. She had been in 3 homes in less than a year. Since Nyx is a wolf/dog, she didn't act like a dog and her owners couldn't handle her. Finally, the same person who introduced us to Archie took her in and contacted Wolfwood. Due to Nyx's escape abilities she had to be kept inside prior to coming to the Refuge and she became incredibly introverted. She would cower in corners and had to be carried out to go to the bathroom. Nyx spent a couple of weeks in the hospital pen at Wolfwood and her behavior continued. However, for her first birthday present (she turned 1 on April 20th) she was given a new pen and a new neighbor, Razi. The change was instantaneous. All of a sudden, Nyx wasn't so shy. She spent time investigating her enclosure and sniffed the leftover scents of the former residents. Nyx then went over and met Razi at the fence. There was no fence fighting or growling. Razi, confident as ever, said hello and Nyx responded. Nyx and Razi are now together as their separate enclosures have been combined. Nyx is named after the Greek goddess of the night. This is Razi. 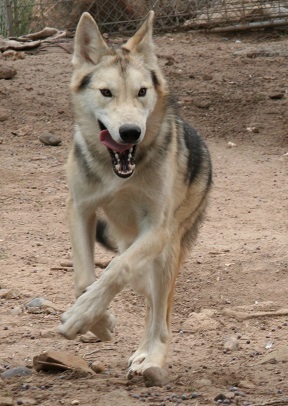 He is a confident, somewhat shy, large wolf who came from northern Colorado in April of 2012 at the age of 2. His owner moved and could not keep him so he took Razi to a vet to be put down. Instead, the staff at the vet's office worked hard to find WolfWood and get Razi here. They transported him to us and even gave us a donation for his care. He prefers men over woman and likes Joel, Ben and Paula's dad. He will lie next to them and even bump them with his nose, but he does not want to be petted and definitely does not want to be leashed. Razi has become a favorite of many volunteers over the years and he even approaches several of them. He also has a calming effect on new arrivals who sometimes become neighbors. His confidence seems to help the new arrivals adjust. Sable is Vesta's son and the brother of Tj and Druid. He is a full dog. 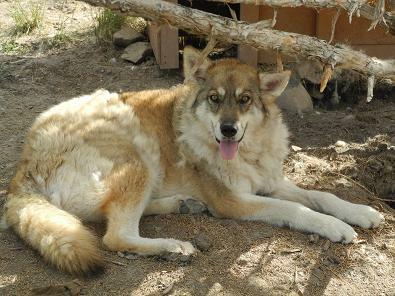 He came to the Refuge in 2008 from Walsenburg, Co. with Vesta as one of her nine puppies. They were in a very bad situation and Vesta was starving and too weak to get up and walk around. She was a good mother but without nutrition, the future of Vesta and her pups was bleak Sable was one of the pups that was adopted after everyone got healthy and he went to a good home with a loving owner. Unfortunately, his owner fell on hard economic times and could not keep Sable anymore. He brought Sable back to the Refuge, as is our policy when things like this happen, and we welcomed him back. Sable is very friendly and lives with his best friend, Akayla. 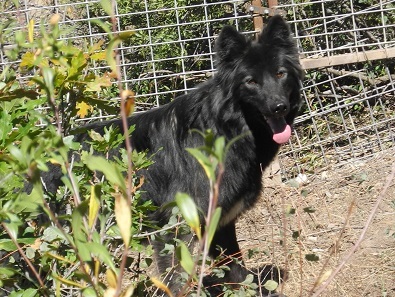 Sam is a dog who joined our Wolfwood family during January 2014. We think he was born around 2008. 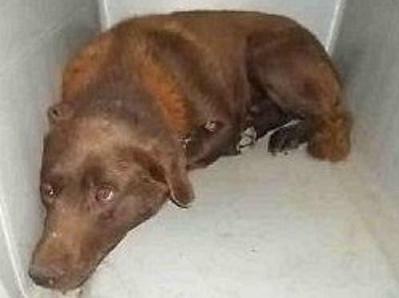 He is a very unsocial lab/mix who was sent to the Adams County Shelter after a hoarding situation was shut down. He was considered unadoptable and was recommended for euthanasia. The shelter kept him for over 4 months looking for a place for Sam. 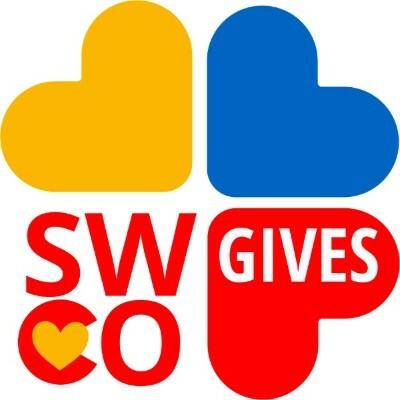 WolfWood agreed to accept him at the request of our state inspector and he was paired with Cinder. However, Cinder passed away in December of 2015. Sam and Cinder were paired in a new pen. 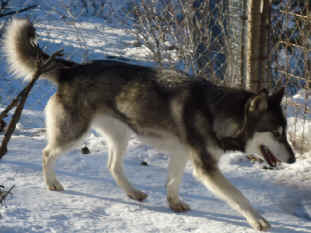 Cinder had been used as a hospice companion for many of our older wolves and she took right to Sam. She made sure he ate and guarded the gate. Sam started to come out of his shell. He went from completely isolated in his house to coming out and looking at people to barking once in a while. He then became even braver and now stays outside his house and barks at people coming up the hill. It seems he has adopted the guardianship of the top part of the Refuge. Sam generally stays in the back of the new pen but has started moving up to the front to see the people better. The change is dramatic. Sam now lices with Destiny. 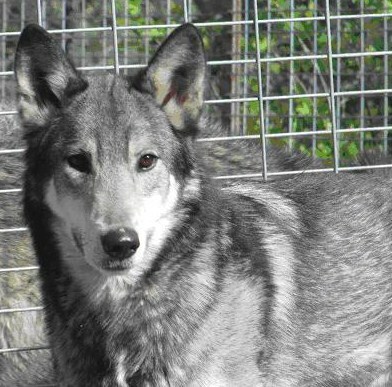 Samoa is a young, low percentage wolf/dog who came to us during May 2013. The connection to Wolfwood was made on Facebook by a friend of her owner. Her original owner had taken her from a bad situation but couldn't keep her anymore due to a relocation. Arrangements were made for the move to Wolfwood through the Aztec Shelter. Samoa is very skittish as she needed to be kept inside a trailer previously. She needs some time to adjust to her new life where she has space to move. Sienna came to Wolfwood during October 2016 from the LaPlata County Humane Society along with Goblin. They had been running loose and were taken to the Humane Society. We believe that Sienna is Goblin's mother. They are very bonded and the Humane Society asked if we could take both to give them a loving and safe environment where they could stay together. Nothing is known about Sienna's time before the Humane Society took them in. We estimate that she was about 6 years old when she arrived. Sienna and Goblin remain together. 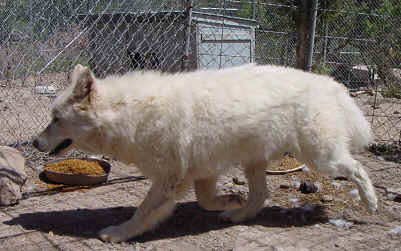 Siku came to Wolfwood during March, 2009 from Farmington, NM as a one-year old. Her owner had to move due to his job and couldn't keep her. She is a shy, submissive animal and will allow you to approach her if she likes you. She lived many years with Orley until his passing in 2018. Siku currently lives alone. Siren is a dog. 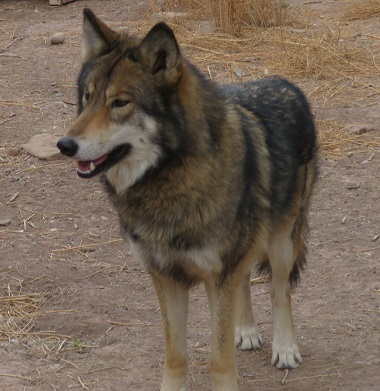 She came to us when we got a call from a person claiming to have a litter of "Mexican red wolves." We assured her there was no such thing, but she insisted. 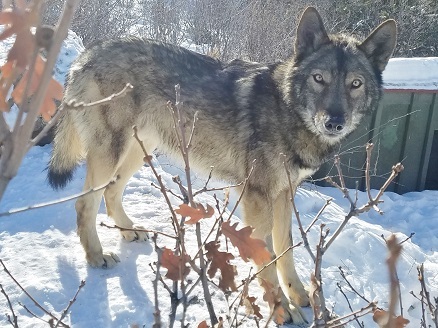 Of course the group did not have an ounce of wolf in them, but we agreed to take them out of their bad situation and brought them home for one of our other wolves, Juno, to foster. We found homes for all the puppies with the help of the La Plata Humane Society, except Siren, who we kept to be Juno's pen mate. Rowan is the third member of this playful pen. 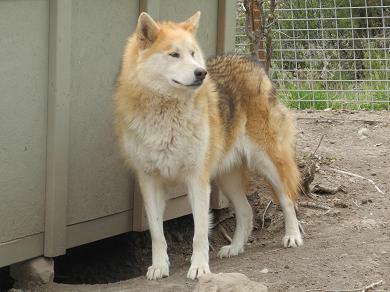 Juno & Rowan have since left the pack and Siren lives with Henna. 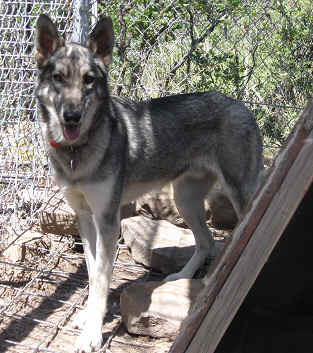 Smokey is a high-percentage wolf/dog who came to the Refuge when he was a puppy. His owner had dropped him off at a humane society and left no information about him other than to say he was a German Shepherd. As he grew, it became obvious that he was not a German Shepherd. 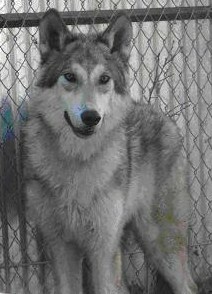 The humane society gave us a call saying they had a wolf/dog and we picked him up. He is very shy around people and lives with Chica. Stella is a 2 year old, low percentage animal who came to Wolfwood during September of 2013 from a private party in New Mexico. She was well treated but her owner had to move and couldn't keep Stella. She is a sweet, submissive animal who loves people and her food! She is very active and happy and has quickly adjusted to her new environment. Like Pan, Stella has one blue eye (and all Wolfwood volunteers know a full wolf does not have blue eyes). She shared a pen with Adama who thoroughly enjoy having a younger pen-mate until his passing in 2014. She now lives with another of our younger animals, Dante. 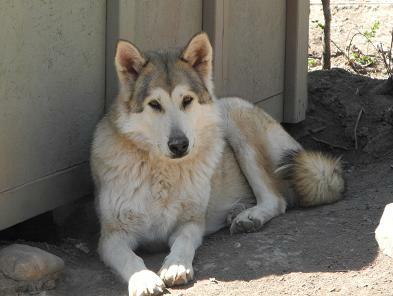 Storm came to the refuge as a 2-year old in 2009 from the Aztec Animal Shelter. He likes to bark but is very sweet. He is quite active and can be a real challenge to catch. Valkyrie came to us from the Aztec Shelter in June of 2017 at the age of 3. She had already had 6 litters of puppies by the time she arrived. She was kept on a chain and severely abused by her owners who used her as a breeding machine. She came to the attention of friends of one of our volunteers (Keith), who felt so bad for her they thought euthanasia was better than the life she was leading. They finally convinced the owners to release her to the shelter with the ultimate goal of getting her to WolfWood. Valkyrie was very sick, starved, and scared. She will bite without warning if anyone tries to touch her. Physically she is already making a good recovery, she has put on weight and is getting healthy. We are confident with time and love she will also heal emotionally. Vesta and TJ are both full dogs. 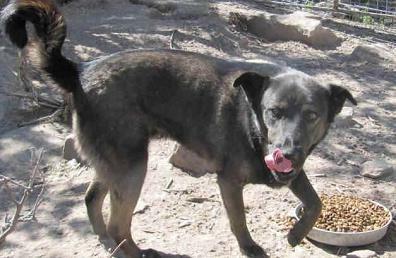 Vesta came to the refuge in 2008 from Walsenburg, Co. with her nine puppies. They were in a very bad situation and Vesta was starving and too weak to get up and walk around. She was a good mother but without nutrition, the future of Vesta and her pups was bleak. She is now fully recovered and all her pups survived due to her motherly instincts and a bit of help from Wolfwood. While most of her pups have been adopted, TJ, Druid and Sable still enjoy life with her at Wolfwood. Vesta is in the foreground of this picture and TJ is in the back. 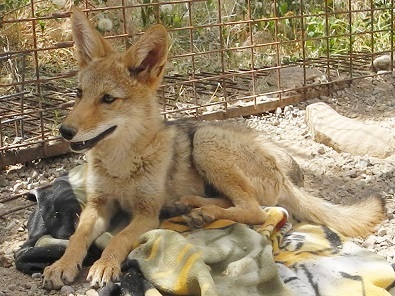 Wile E. is a coyote who was found abandoned and alone June of 2016. He had only been born a couple of months before that. After talking to Dr. Wagner and different wildlife rehab places it was determined that he could not possibly be put back in the wild. So Wile E began his journey to adjust to refuge life. Wile E. initially had to be kept quarantined because he had no immunity to viruses like Parvo or Distemper. He also had to get special vaccines and, at first, be fed a milk replacement. Wile E. will be part of the Refuge's educational program where the differences between various canines (wolves, dogs and coyotes) are explained.